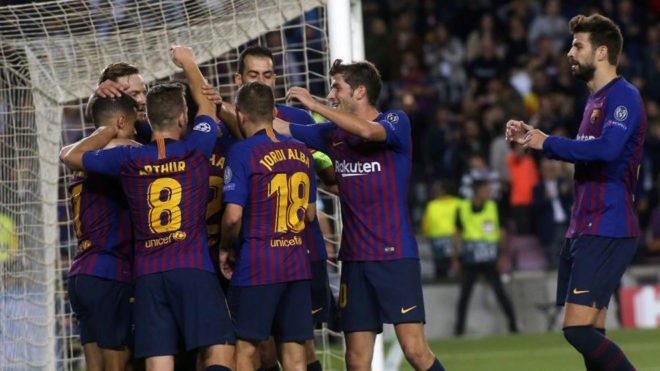 MILAN — Barcelona qualified for the knockout stage of the Champions League despite Mauro Icardi snatching a late 1-1 draw for Inter Milan at the San Siro on Tuesday. "We played the best team in the world and they scored a typical Barcelona goal, but we never gave up, we kept fighting," Icardi told Sky Sport Italia. "We didn’t give up after they scored and fortunately the ball bounced to me... there was a bit of luck that the ball arrived there." "We could not clear a silly ball inside the area and we paid for it," said Barca midfielder Sergio Busquets. "I think we have deserved more. we were more ambitious and we dominated the whole game." "I think Barcelona played far better than us and we could’ve done more. They came forward too easily in the first half and when you leave them possession constantly, you are going to be pinned back," said Handanovic. "We just switched off a bit in the final moments," said Barca coach Ernesto Valverde. "We know that Inter have picked up a lot of points in the last minutes.